In his evocative album Dream Streets, Cornelius Dufallo draws inspiration from the beauty and symbolism of the New York nightscape. Both urban and organic, the acoustic and electronic interweave to create tides of a dramatic, unconscious narrative. Dufallo’s luscious violin sound emerges slowly and mysteriously, striking a steady groove - one that echoes with the rhythm and variety of a city street and the flow of an underwater current. Heralded by the New York Times as one of the “new faces of new music,” and praised for his “taut virtuosity,” Dufallo is well known for his work with the amplified string quartet ETHEL, and the creative music ensemble Ne(x)tworks. With Dream Streets, Dufallo takes his first serious steps outward as a solo artist. In development since 2004, Dream Streets reflects upon a wide range of experiences, from the deeply personal (in the groove oriented pieces Lighthouse and Waiting for You) to the philosophical (Transcendence was written as a meditation on compassion and the evolution of the human spirit). Other pieces, like Naiad and Suite for Electric Violin are closer to pure musical explorations. In Dream Streets, Dufallo equates melody with consciousness. As the album unfolds, its tracks wax more abstract and atmospheric, moving toward a sonic dream world. The reverb of the violin supplants earlier wistful tunes and meandering rhythmic grooves trail out to naught. Dufallo’s music reaches a state of emotional stasis that detaches earlier movements from the album’s peak. However, Dream Streets’ final movement opens into a burst of aural exaltation—a new face formed in hard weather. The man with coolest name in the world and an emotional violin attached to his capable hands. 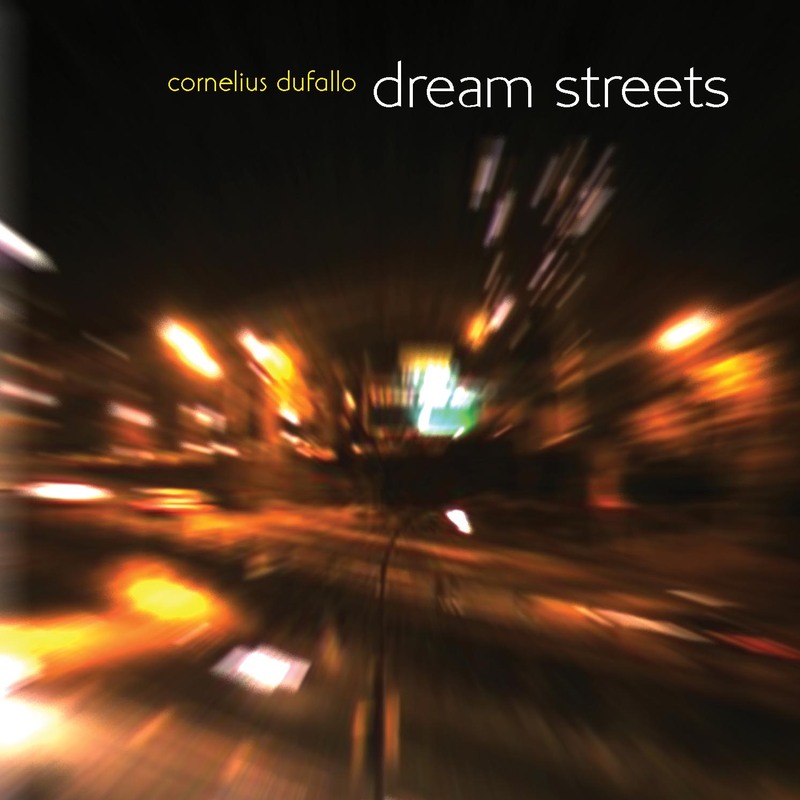 With Dream Streets, Cornelius Dufallo ushers the grand tradition of solo violin virtuosity into the 21st century, seamlessly blending technology with his artistry to produce richly layered textures that are nearly symphonic in scope. The wild ride this "dream" takes us on ranges from meditative calm to urban cacophony. Most importantly, it is the manifestation of a fiercely creative vision and a work of fearless- and timeless beauty. Known as the leader of Ne(x)tworks, a violinist in Ethel and a composer to be reckoned with, Cornelius Dufallo celebrates the release of Dream Streets, a beautiful, evocative disc of electroacoustic soundscapes newly issued on the Innova label. Some of the pieces on the disc cut poppy grooves, while others drift and disintegrate in a gauzy haze; all serve as apt reminders of this vital artist’s considerable gifts. And before I go, I just want to mention that I’ve had a chance to listen to Cornelius’ new CD, Dream Streets, which you can find on iTunes or Amazon, and is well worth spending some time with. If you are into the whole amplified-violin-looping-thing then you’ll love this recording. He has an original voice in this genre and I really love that when I’m done listening I don’t feel like he was just showing off or trying to impress someone. Cornelius Dufallo’s Programm, Dream Streets, uses additive process, via loops, to bring each of his pieces to life. Reverb, delay, filters, and other effects are used heavily to create soundscapes, as in ‘Carillion’, the second movement of the suite. Other pieces create clear melodies or at least suggest known forms. ‘Lighthouse’, complete with rain sounds, oscillates between a blues-folk melody and a wall of sound. The suite’s ‘Passacaglia’ is heavy on digital manipulation; but, even though it has all the motion in the piece, the violin chords entering and existing above it are the important line. Dufallo’s approaches to the solo violin, bolstered by electronics, is one that cultivates innovation without the expense of becoming austere, esoteric clouds of digital editing. The electronics do not lend themselves to toe-tapping or the rhythmic trance created by additive process, but Dufallo’s interest intent seems to be to elicit emotions. As a member of the enterprising new-music ensembles Ne(x)tworks and Ethel, the violinist Cornelius Dufallo runs into plenty of composers. He has coaxed new solo works from some and taken up older scores by others. He is also a composer himself: “Dream Streets,” his new CD (for Innova), is devoted to his own imaginative works for violin and electronics. Virtuosic in every detail, these works for violin and electronics are full of expression and ideas at play in a broad emotional and intellectual range. The enduring benchmark for exploring solo instruments remains Fred Frith's 1974 Guitar Solos, an electronic extension being many of Robert Fripp's Soundscapes releases. Duffalo's work on violin seems to be in that spirit, but very different in approach and intent. In some ways more traditionally musical than the pure experimentation of Frith or the stratified eventides of Fripp, Duffalo spins out beautifully articulate phrases that build into and across their own controlled repetitions and variations while remaining highly sensitive to the primacy of sound. Electronics and some audio vérité play supporting and contrasting roles, dropping us off on a busy street or leaving us to contemplate a sudden absence in the midst of a gentle rain. These unpitched accompaniments usually enhance the timbral hardness or softness of the violin as it falls into and out of self-determined solos, duos and trios, rhythmic, pizzicato or legato passages in firmly constructed, harmonically complex, purposeful movement. Duffalo's playing - and sense of play - are fluid and entertainingly enlightening as he traverses abruptly caustic or reflectively pelagic expanses with unconstrained ease and purpose. Comprised of nine concise, mostly short pieces surrounding the six part "Suite for Electric Violin", Dream Streets is a highly accomplished first solo effort from the violinist of the ETHEL quartet and member of Ne(x)tworks that exhibits experimental, inventive and musical attributes in near perfect proportions.